We are taking a spin around the league for a quick last-minute preview of each division before the season starts, hitting the most fantasy football-relevant options in each offense. Up first is the AFC East, which has an unusual scheduling quirk. Each team has the same bye week, so keep it in mind if (for some odd reason) you plan on taking a particularly AFC East-heavy draft approach. The division will take on three tough defenses (and the Colts) from the AFC South, as well as square off with three talented defensive units (and the Lions) from the NFC North. The intra-divisional schedule is not imposing, as no AFC East defense appears on the verge of dominance. Of course, what we know now and what we will begin learning in a couple weeks do not always line up. Here is what we know now. Buffalo is shaping up as a fantasy wasteland. Even the team’s best player, LeSean McCoy, has dark clouds above his head. The pass-catchers are uninspiring, to be kind. Only if rocket-armed rookie Josh Allen can somehow harness his howitzer will they surprise their dubious observers, of whom there are many. A dampening issue the Bills seem destined to run into is play volume. Sustaining drives with an inconsistent quarterback, questionable passing game weapons, and our 29th ranked offensive line, will be a challenge. While thin in spots, the defense should be competitive, but won’t last long if the offense produces too many three-and-outs. Best fantasy value: Charles Clay, TE – Touchdown opportunities will be an issue, but he’s drafted well outside the top-12 tight ends and was targeted at the second highest rate on a per-route basis last year. Fantasy bust: LeSean McCoy, RB – His price has dropped due to a domestic violence investigation, but the 30-year-old with a ton of miles on his tires is staring at poor run-blocking, sub-optimal game scripts, and he was limited recently by a groin injury. Sleeper to watch: Chris Ivory, RB – If McCoy is suspended or continues to get banged up, Ivory would face little in the way of established competition for the lead role in the Bills backfield. Rookie(s) to know: Josh Allen, QB – It promises to be a wild ride with leaky pass protection, but Allen has shown during the preseason he will mix in good plays with the head-scratchers and reminded us his mobility is an underrated asset. 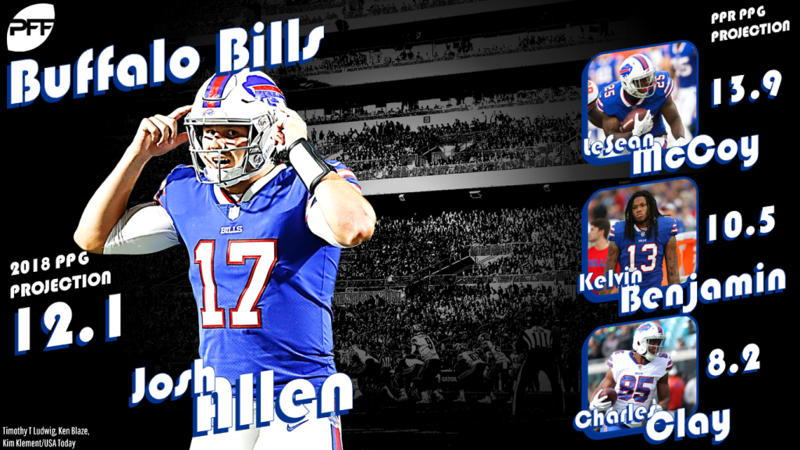 Best current player for their 2020 roster: Allen – He is literally the only player we can be sure will be on the Bills roster in two years. Buffalo is not exactly a hotbed of dynasty league fantasy value. 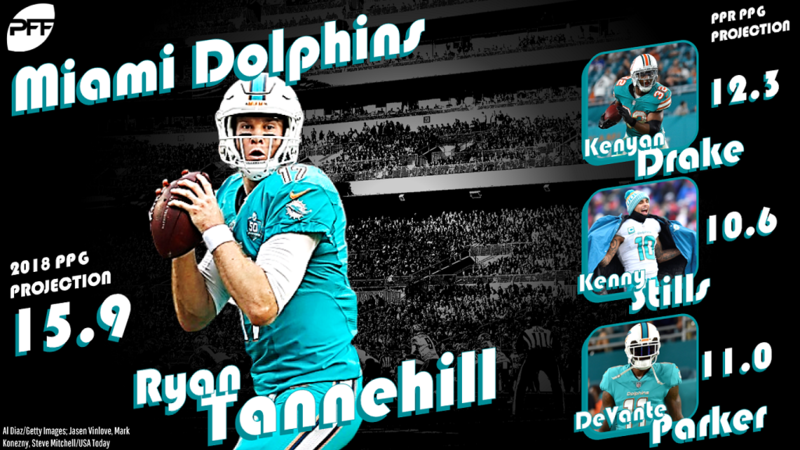 The Dolphins got Ryan Tannehill back, bid adieu to Jarvis Landry, and – despite apparently hitching their backfield to a 35-year-old wagon – have made their annual promise to play at a faster pace. If you think there are mixed signals coming from Miami, you are not alone – and should know by now that’s business as usual. Even their typically optimistic beat writers don’t seem enthusiastic about the Dolphins this summer, and there hasn’t been any irrational hope surrounding former first-rounder DeVante Parker’s mythical maturation process. There are a couple rays of light emanating from the fog, however. Best fantasy value: Kenny Stills, WR – His ADP is slowly creeping up, but not fast enough to disqualify Miami’s top wideout from crushing his draft cost amid a boatload of available targets. Fantasy bust: Kenyan Drake, RB – While he would easily pay off his fourth-round draft cost if given a full workload, reports have Frank Gore playing “a lot” – which would mute Drake’s upside nearly as much as it would be a crushingly stupid organizational decision. Sleeper to watch: Danny Amendola, WR – He won’t be a league winner, but with an end-of-draft price tag and a ton of opportunity as Tannehill’s slot receiver, Amendola is an unsexy pick who could come in handy. Rookie(s) to know: Mike Gesicki, TE, and Kalen Ballage, RB – The Dolphins spent a reasonably valuable pick – fourth round – on the Arizona State three-down back, but second-round athletic freak Gesicki is more relevant, as the tight end appears set to start right away. Best current player for their 2020 roster: Stills – Slated to make only $6.9 million in 2020 (a bargain if he continues on his current trajectory), Stills will still be only 28 years old despite seven seasons of NFL experience. Despite losing Brandin Cooks and Danny Amendola, while having to deal with Julian Edelman’s four-game suspension, the Patriots’ fantasy soil remains among the most fertile in the AFC. From Tom Brady, to Rob Gronkowski, to Chris Hogan and Rex Burkhead, New England’s top fantasy assets don’t come at a huge discount, but most are worth it. Facing divisional cupcakes six times per season has contributed to consistently soft schedules, and the Patriots’ annually elevated play and point totals are among the NFL’s most bankable fantasy assets. 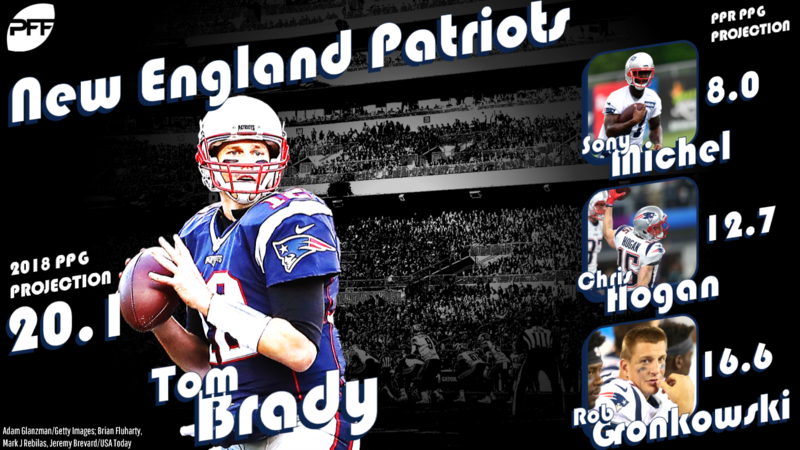 We want as many pieces of good offenses as possible, and New England’s is one worth gorging on. Best fantasy value: James White, RB – In PPR leagues, we can do much worse than spending a double-digit-round pick on Brady’s most trusted backfield target and negative game script dynamo, especially while they’re thin at wide receiver. Fantasy bust: Tom Brady, QB – It’s hard to envision Brady producing a poor season even with a depleted supporting cast, but any quarterback who is sometimes picked in the fourth round will struggle to overcome the misuse of fantasy draft capital. Sleeper to watch: Phillip Dorsett, WR – The No. 2 wideout job on a paper-thin receiver depth chart is his while Edelman is suspended for four games, and Dorsett’s positive practice performances started to show up in games as he gained Brady’s trust. Rookie(s) to know: Sony Michel, RB – He is the obvious choice to make year-one fantasy noise in a notoriously fluid backfield, despite being dealt a setback via an early-August knee procedure. Best current player for their 2020 roster: Michel – The first-rounder will be in his third season with the team, and while his redraft ADP has temporarily sunk, his dynasty cost remains justifiably high. Jets camp is filled with more hope than at any time in recent memory, and it’s radiating from behind center. Not only has first-round pick Sam Darnold been every bit as advertised, New York deftly turned a low-risk gamble on Teddy Bridgewater into a third-round pick. With Josh McCown providing a backup baseline of competency, the New York Jets appear set at quarterback. Life comes at you fast. Competent quarterback play obviously buoys the fantasy fortunes of several Jets pass-catchers, but it raises the floors and ceilings of their running backs as well. If New York’s offense is going to be even minimally viable, it will mean more rushing, receiving, and scoring chances for their quietly talented weapons. Best fantasy value: Bilal Powell, RB – A double-digit-round price tag is extremely affordable for a strong pass-catching back who played ahead of Isaiah Crowell this preseason, for a team that will face its share of negative game scripts. Fantasy bust: Isaiah Crowell, RB – If Crowell cedes most of the passing-game work to Powell, Elijah McGuire, and/or Trenton Cannon, New York’s most expensive fantasy asset’s workload won’t be bankable when they are trailing. Sleeper to watch: Quincy Enunwa, WR – A seemingly forgotten man after his sunk 2017 and early-camp thumb injury, if Enunwa can get back to his 2016 form, the sneaky size/speed specimen can sizzle in the slot at a barely-there draft cost. 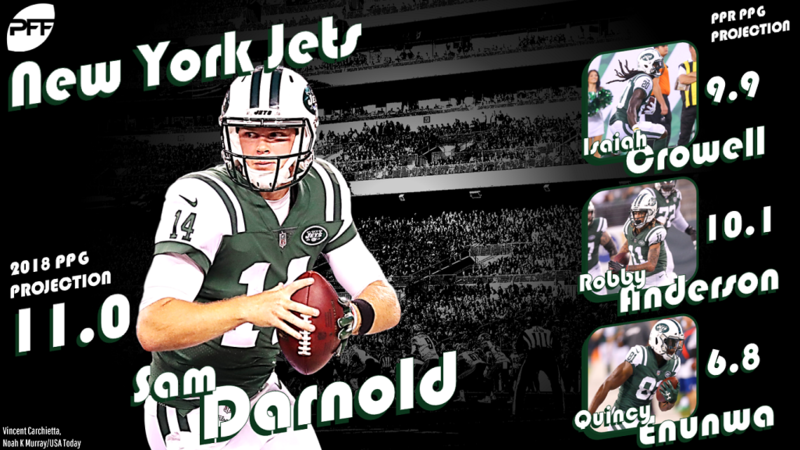 Rookie(s) to know: Sam Darnold, QB – The hopes of one of the league’s most woebegone franchises rest on the development of a 21-year-old poised to break to be the youngest opening-day starter in history. No pressure, kid. Best current player for their 2020 roster: Robby Anderson, WR – If the volatile 25-year-old wideout doesn’t blow his shot off the field, Anderson will make sweet music with Darnold for years to come.